Monte Cook’s “Legends and Lore” columns at Wizards.com have been interesting. In them, he seems to be painting a picture of a theoretical future version of D&D, and while I can’t say for sure that he is, it makes sense if you assume he’s been rehired by WOTC to help design 5e. I’m a believer in that he’s there for that. But that’s not what this is about. In his column, he tends to ask questions regarding rules in the game, and about how much or how little they are needed. The following quote comes to mind, it appeared in this column. Since the launch of 3rd edition and continuing on into 4th edition, the game has focused more on providing rules directly and overtly. This approach also made it easier to adjudicate situations that the rules didn’t cover explicitly. Prior to 3rd edition, however, “the DM decides” wasn’t just a fallback position; it often was the rule. Now, as I’ve read the columns, I can’t help shake the feeling that a decade later, Monte may be wondering if the direction that he helped take D&D in the year 2000 was the right one or not. I’m not saying if it was or not, I’m saying that I get the feeling that he himself is wondering, but he hasn’t found an answer yet. One thing that I’ve thought about a lot lately is the role of the DM through the years, and it came back to me because I am currently running two very distinct fantasy role playing games, with two very different roles for the DM (apart from crafting the story, of course). Two very different ways of judging cover. One is in the DM’s hands, the other really isn’t. So the open question I want to ask is the following: How much do you think the role of the DM has changed throughout D&D’s lifespan, if at all? And if that’s a good thing or a bad thing? What do you prefer? Am I completely off base? Lets discuss. I don’t think it’s a changing role per se, but more just about different styles of play. 4E D&D is a very different animal from DragonAge. The same could be said about Savage Worlds, PFRPG, or any other RPG – the rules themselves set the stage for how the game should be governed even before you start rolling dice – and that’s the role the GM plays. It’s been said before: If there’s a rule about something in the books, the players will tend to use it only if its in their favor. The GM/DMs job is to set the tone for who is setting the rules or the game. Is she the artibitor or a referee? Is she making rulings or enforcing rules? This is mainly why I’ve stopped playing 4E in favor of SW and Pathfinder (which on the rules vs rulings scope is somewhat in between IMHO). I haven’t played DragonAge yet – but everyone seems to love it, I should probably give it a whirl. I think I’m becoming a bit of a grognard, in that I can see that if a game offers a particular style of play, and then it suddenly doesn’t, people may not be too happy about that. I never thought of it that way before, but I guess it’s true. As someone whose primary gaming experience over the past 25-30 years has been as a DM, I think you’re pretty much spot on, it’s actually a huge part of why I never made the jump from legacy AD&D to 3e. The flaws in the game was never a case of not having enough rules. I am sure there are some bad, mean DMs who needed these extra rules to be fair, but they probably never ran campaigns that lasted any amount of time, and they’d just fudge or forget rules anyway if they weren’t fair. In legacy versions, sticking with that example, if you had decent cover, and an archer was nailing you frequently, that could well be a plot point (your grandmaster archer is going “how the hell are they doing that!? That should not be possible!”) and figuring out WTF could well be important (well, you probably should not have pissed off the diviner and the air elementalist who are telling the archers when and where to fire [for example].) I feel the later rules pretty much just encourage players to go ‘nuh, uh, I can’t be hit here, and you’re not being fair’ and it encourages the players to seek a game mechanic way of solving problems instead of an in-game way of solving problems…or as I call an “in-game way of solving problems,’ PLAYING the game. And that tells me that the game is no longer trusting the DMs to be the imaginative hub and craftsman of the story, something I attribute to the saturation of other media and considerations…where most often flashy graphics and programs do all the decision making and option-manufacture so a player need only be at best a speedy-mouse-clicker or the like. I’ve always thought rules were guidelines that allowed you to use mechanics to explain or develop actions with a risk attached (you could leap the chasm, or die trying). But over the successive evolutions, it seems that the rules got more firm and created a set of player-blinders, reducing the single greatest product of the game, imagination (although, yes, that could be a function of the people I’m playing with). Granted, I have NO Pathfinder experience, but I think even armed with that, my views wouldn’t radically change. I feel like we have found over time that having a wide disparity in approaches to the rules is a problem. In an increasingly connected world we can more readily find gamers (through OP, online, via forums, via social networks, etc.). Finding that the gamers play the game differently is often a hindrance. Even at a single table there is a friction in place if the DM and players have a different understanding of how the game should work. I think that’s why over time the rules have become more exact. It has certainly been great for blogging to have 4E be so transparent that so much can be shared that can be instantly dropped into nearly any home or OP campaign. But, at the same time there is always a need for DMs to adjudicate play and guide play. I can’t really say it better than the interview Scott Fitzgerald Gray gave to ID DM, with lots of tips for why DMs still matter. I think the overall goal of rules clarity but DMs improvising and guiding play is a good advancement. But, clearly the rules need to communicate that the DM still has those responsibilities – the message wasn’t there. In my opinion, the role of the DM should be up to the DM. He/she can tailor the rules to their particular gaming style, regardless of what is printed in the book. The DM’s job is to help craft a story, much like a movie director. He/she guides the characters along the storyline and needs to make judgment calls along the way so the story makes sense, is contiguous and is enjoyable for the players. If you want to follow along with rules printed in a book, line by line, play a trading card game. If you want to play a role playing game, creating an epic story with vibrant characters, be flexible. As both a player and a DM, I believe the best balance is somewhere in between. When I’m playing, I like to have a firm grasp of the rules to know what I can and cannot do explicitly, because I think a little bit of black-and-white helps relieve the pressure on the DM to become a rules lawyer and simply tell a story. That being said, if I have an idea, and it isn’t explicitly covered by the rules, I like my DM to weigh in on it. If I’m trying a challenge, but it would be in-character to use a different skill that normal, or a different set of modifiers (like a mute thug using his physical strength to intimidate, instead of his charisma), I want the DM to present that flexibility. 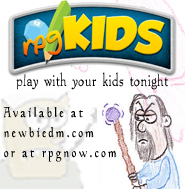 I am not convinced that a DMs role has really changed much over the various editions of D&D. Nor do I believe that the DMs role changes much based on the particular game system being used. This likely comes from my perspective on what the DMs role is. I think the DM is a game designer, storyteller and an entertainer. The rule system of any particular game is little more than a tool box to aid a DM in accomplishing these three goals. Speaking only for myself, I like games that rely heavily on an improvisational give and take between player and DM which also strongly reward player skill(yes, I said metagaming there! )and imagination/ingenuity on the part of the game group. I have never felt that I couldn’t change a rule, make a rule or completely ignore a rule if I thought it would help me design an entertaining experience for my friends. As long as a DM is consistent, any house rule is fair game. Any on the fly rule change/interpretation is fair game. And let us not forget, the thrust of the article seems to revolve around what the DM is supposed to do when a rules question is asked, and how the evolution of the game may have changed the answer. As far as I am concerned, the minute a player asks a question they are indicating that they don’t know the answer and the DM is just as much a ‘final arbiter’ today as they ever were in previous editions. If anything, I think the presence of more, and more elaborate rules exist for the benefit of both player and DM, but primarily the player. Players now have a much clearer idea of pwhat their characters can do in any given situation. This should reduce the number of rule questions at the table(if you have a set of even reasonably organized players)and let tue DM focus on what their real role has always been: creating an exciting experiences for their friends. My last point was that once you grip the core mechanic, everything else can be run with imagination and improv anyway. Make up a DC on the fly amd the rest is gravy. I think the role of the DM has changed if you only look at the way the rules are written. What the game asks of the DM has changed. However, I run 4E pretty much just like I ran 1E. The rules are there and we use those that “make sense” and then adjudicate the rest on the fly. We allow on the spot rulings to overrule the textbook rules in most cases. For example, maybe according to the book, a player might not have cover, but perhaps the player explains the vision of how he sees the battlefield and in that description he would have cover. As the DM, if his description sounds good and he seems to really believe what he’s saying, and/or the other players seem to be convinced, then I allow it, because now, he truly DOES have cover, because we all “see” it. This is the type of collaboration really enjoy. The same goes for conversations with NPCs or interaction with enemies. It’s a challenge for the DM but it keeps the game fresh. I think older editions perhaps were more conducive to this mindset but you can still do it if you (and your group) really want to. I agree with Steve above, especially his last point. For me the 3.x/Pathfinder systems are sort of the sweet spot for gaming (not to slight 4e, I just don’t have enough actual play experience to comment greatly on it, though I am pretty sure I could play the game I want to play even with the 4e ruleset). If one goes with the attitude of the rules are a guideline the GM remains a judge. The d20 skill resolution is really just a set of guidelines to help guide a GM during skill or conflict resolution. The GM has enough information to determine a DC on the fly and the player has a consistent mechanic and defined set of skills and modifiers to make a roll against that DC. Going to your specific example of the person seeking cover from an archer. In my games that decision is still made quite quickly and doesn’t really require needing to draw lines or lay down rulers to see. If there are boulders as part of the terrain and the player wants cover, of course they can get partial cover. That to me hasn’t really changed over editions. I, as GM, still describe the environment and help the player understand what options that environment provides for their character. The rules still just facilitate this as guidelines. Playing extensive 2E, it was all a complete crap shoot. There was no firm foundation on either the player or DM side. 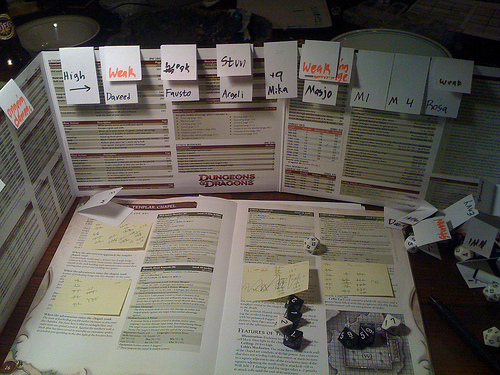 Playing 3E, there was a firmer foundation and this often led to the kind of things we saw in the Gamers movie… “why can’t I sneak attack with a giant crossbow?” The DM was forced to know a ton of stuff to counter the players, because the realistic system forced a thorough knowledge of “why not”. Look at 3E spells for examples of the huge variance in interpretation. In 4E we have the exact opposite. The rules are so defined that everyone with some experience knows the core basics. Spells are based on common power structure. And then you have players now being the masters of PC rules. A DM says “you can’t do that” and the player proceeds to prove the PC can do that. No edition will remove that to some extent, and you always need players and DM working together to avoid rules lawyering in either direction. But, I again feel that 4E has been an improvement in removing most rules discussions. I certainly see far less at my home and OP tables. For me, it frees me up to do a lot of creative play based on the common understanding. On the other hand, when I play 3E or RPGs with looser rules I then get to be wackier and just rules-build as I go. Still, I find myself preferring 4E as my core experience. I’d say that DM fiat hasn’t been changed; and the 4E rules save the DM from having to continually justifying saying “no” to players’ pleas for special treatment in-game. It’s quite possible to work around them if you have confidence and still tell the story you want to tell. However, there are some fundamental issues in 4E that get in the way of the ability to craft a story (the treasure system, which many DMs eschew in favour of Dark Sun style inherant bonuses so that they can make treasure more “special”, for one example) – a lot of it is a problem with scaling, or the omission of useful rules. An example of the scaling problem is that economy is fundamentally broken; a lot of the cost of items, or the static DCs of mundane tasks, become irrelevant even during the heroic tier; why buy a torch, candle, whatever when your adventuring kit comes bundled with sunrods? Yah you can handwave and say “Sunrods are rare here”, but that means having to recraft an entire setting just to exclude one item, pretty silly. Given the tools of poster-maps and dungeon tiles – how to shift game design from the “one encounter per room” style to a fully laid out dynamic multi-room dungeon). I’ve heard some people complain that rigid rules systems constrain the GM. I look on it as something that lets me focus on telling the story. I’m not great at making consistent rules judgements in a rules light system. If I’m having a bad day, then I judge things differently than if I’m doing well. Sometimes if I’ve just seen a movie or read a book, that will influence me unconsciously. Having a good framework to work with lets me not worry about that part and go on with the other fun parts of DMing. Even when there’s something not covered, having more examples to work with gives me a better reference to judge. I also have an issue with DM’s that rule inconsistently on the fly. If the DM said I could jump a 15′ chasm last week and I run into a 15′ chasm under similar circumstances I expect that I’ll have a good chance to do it again. If a DM’s been inconsistent, then I have to slow down the game to try and figure out what the current laws of physics are. Some DM’s don’t even like to give clues as to how likely something is. In a rules heavy game, I know the odds. Just like in real life, I know a good idea of how far I can jump. I’m not saying that there aren’t good on-the-fly DM’s (though many DM’s overestimate themselves), or that you can’t have fun in these games. It’s just not my cup of mead. @Ace42, each set of rules has some assumptions in them and those assumptions support different styles of playing. D&D has changed over the years from gim ‘n’ gritty to high fantasy. The rules can be tweaked, but the further you try and go with it, the harder it is. If you try and play 4e like 0e, you’ll need to do more work. Luckily, DM’s today have a lot of resources on the internet. Still, there comes a point where you have to decide if you’d rather modify a game to your style or look for a game with base assumptions that fits what your group wants. I’m one to lean toward judging situations “off the cuff” even in 4th Edition – the way I see it, the “DMs Best Friend” (+/- 2/5) is fast and easy to remember, and most of the specific rules are derived from there anyway. Unless you’re playing with huge rules-lawyers that’ll be enough, and I’m lucky enough that I don’t play with any of them at the moment. I feel like the hyper-defined rules for things like cover are mostly there to benefit organized play, an aspect of the game I’ve never really taken part in. I feel that, as others have pointed out, the expectations for what the DM knows vs what the players know has been the biggest change. It used to be that the only person who need to own and read the rules was the DM… now every player has access to and is expected to know the rules for their PC at least, if not the whole party, and often they are pretty knowledgeable about the monsters as well. I always run games. I haven’t played in a game of D&D since 2002 or so. I’ve run 3.0, Pathfinder, and 4e (as well as Shadowrun, V:TM, Paranoia, and others). I personally am in favor of the move toward more rules. The rules in 4e are very simple to learn for players, especially compared to previous editions. I’m not sure if anyone who says they prefer AD&D or 3.x to 4e as a DM experience has run a full campaign of 4e because it’s friggin’ EXHAUSTING running other systems. In 4e, I can just draw the map or put down the tiles, give a brief explanation of what’s going on, and the players will know what they can and can’t do. Maybe I’m just lucky in that I don’t have the problem of players who play their power cards rather than their character, but I find that the 4e system takes a LOT of the workload off my shoulders so I can focus on making the story entertaining. These days, I can do voices for the NPCs and describe little nuanced things and basically do more fun things because I don’t have to keep track of EVERYTHING in the game. I like maps and minis. I like solid rules for cover and terrain effects. I like all the things a lot of the things people complain about in 4e. And I always remember Rule Zero which states that the DM is always right, because I can and do change the rules if I want if I want to play with a looser style. It’s up to me to decide how much or how little work I want to do as DM so that I can pay more attention to making sure that my game is as enjoyable as possible for my players. I see a lot of comments from experienced DMs on the his newbie site. I love it. But from the perspective of a new DM (my first table top RPG ever was 4e D&D in June 2011) how do you ease a newbie into the rule of DM with out some solid rules to start? Also, while I do believe EVERYONE has some creativity or an area of creativitiy, not every DM can be as imaginitive. I started running my own 4e D&D game a few months ago. I plan for it go a very long time. We are four sessions in, our characters are on the bring of Level 3, and I don’t think we have had any rules bog. We do our best to know the basics, if there is an argument, I allow a few seconds for the player to tell me IN-GAME terms on why it should work that way, and if it makes since we do it. If someone wants to reference the rules, I usually adjudicate then and there and allow them to refernce the rules whiel its not their turn. We won’t amend a past ruling, but we will fix it and learn for next time. In summary, if you don’t start with a solid rule base it is going to be more difficult to bring fresh blood into the role of DM, possibly strangling the growth of the gaming population making it more difficult to play at all. I started as GM of Basic D&D. Then, two months later, the Dungeon Master’s Guide and Player’s Handbook hit my hobby store. I scooped up the PHB first and we started playing. A few months after that, I picked up the DMG. What I liked about this, in hindsight, is that Advanced built on Basic, though it was a completely different animal. And then the DMG offered a lot of optional rules. Many of those options linked-in via tables. Want to add these extra rules, just add this table and a few parameters. AD&D extended this through Unearthed Arcana. More options to pick and choose from. It worked well for us. We chose the pace of increased complexity. Overall, I’m in favour of more GM fiat, especially through design during prep and at the moment of action resolution during games. Well designed, structured rules make things clearer between the players and the GM. More clarity in the shared imagination space means the players can better evaluate what their characters can do, and that means they have more freedom, not less.